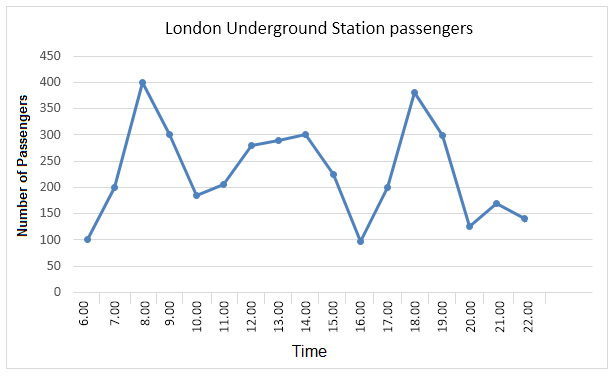 The graph shows the Underground Station passenger numbers in London. The highest numbers of people use the station in the morning and more specifically at around 8:00 in the morning. A rapid growth can be observed between 6:00 am and 8:00 am in the morning when around 400 people use the station at around 7:30 am. This number then quickly drops to below 200 at around 10:00 am. This translation is from Laokaoya website. Again this number rises between 11:00 and 3:00 pm when around 300 people use the underground station with some fluctuations.